A permanent residency card (green cards) is conclusive evidence of someone’s lawful status in the United States. It also shows that the person can live, work, and travel in the United States. Permanent residency is for life (thus the term “permanent”); however, the card must be renewed every 10 years. The green card is legally form I-551 issued by the United States government. A green card may be acquired on the basis of a family petition, employment petition, and/or seeking asylum. There are other avenues to acquire residency and a green card. 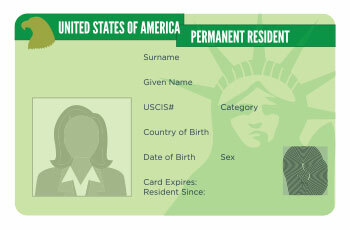 Green cards can be renewed or they can be reissued if they are lost or stolen. To renew a green card, the government will retake finger prints of the person seeking the renewal or re-issuance of the card. They will ensure the individual is still eligible to become a resident of the United States. In some circumstances, a person may want to wait to file for a renewal or re-issuance of the green card if there are any arguments that can be made against the residency (i.e. abandonment). For this reason, it is critical that a legal permanent resident speaks to an attorney before renewing the green card. A green card holder is a lawful permanent resident of the United States. This individual enjoys all the rights and privileges of a United States citizen, with some exceptions. For example, a legal permanent resident cannot register to vote in a United States election of any kind. In addition, a legal permanent resident must show good moral character and not commit any criminal law violation that would render him or her deportable. In addition, it is the duty of the legal permanent resident to always have his or her green card with them at all times to prove lawful status. Green card holders are entitled to a social security card and number. They have the right to own and operate businesses. They are also vested with a all constitutional rights afforded by the federal government and by the state. A legal permanent resident may abandon residency voluntarily or involuntarily. If a legal permanent resident no longer wants to reside in the United States, he or she may file form I-407 (Record of Abandonment of Lawful Permanent Resident Status). He or she may talk go an immigration or consular officer and simply surrender the green card. Individuals seeking to abandon residency are strongly encourage to talk to an immigration attorney before filing any abandonment paperwork or voluntarily giving up residency to the United States. Residency to the United States can also be abandoned involuntarily or by mistake. A legal permanent resident of the United States must show that he or she resides, in fact, in the United States. Trips outside of the United States for long periods of time may be sufficient evidence that the individual does not reside in the United States. Changing address to an address abroad may be evidence of the abandonment. Before taking a long stay outside of the United States, a legal permanent resident is advised to seek advice by an immigration attorney. To contact our office and discuss if you and/or your family member may become a resident of the United States, please call (509) 927-3840.